Enjoy a nice bottle of wine while you’re travelling! 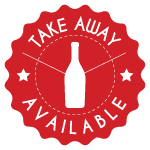 All our bottles are available to take away. In other words, you can buy it at our restaurant and drink it somewhere else. NOSE: Bouquet of red fruits and blackberries enhanced by hints of roasted scents. PALATE: The palate is marked by a full bodied structure and soft tannins, enlivened by a delicate freshness. NOSE: Intense, full of red fruits. PALATE: Harmonious and well balanced. NOSE: Fruitiness and aromas of ripe berries. PALATE: Smooth, generous wine, with the bouquet aromas. FOOD MATCHING: Ideal to serve with red meats and pasta. The wine displays a pleasant roundness, starting on the palate with flavours of ripe red berries, blueberry on a velvety finish. COLOR: Gem deep red liquid, slightly pomegranate. FOOD MATCHING: Recommended to drink with BBQ, fungi and other food. COLOR: Deep ruby red color. NOSE: Rich nose of red fruits. PALATE: Roundness, fruity wine with silky, melted tannins, both complex and balanced. FOOD MATCHING: Comté cheese cookies with hazelnuts, brownies with pecan nuts, duck magret with cranberry sauce. GRAPE VARIETIES: 80% Grenache, 20% Syrah COLOR: Intense red. NOSE: Pepper and red fruits. White meats, lamb, sweet cheeses. NOSE: A red wine that will delight your palate with delicious fruit flavours( raspberries, strawbarries, cherries) and notes of vanilla. PALATE: Silk-smooth and easy-drinking. FOOD MATCHING: A charming wine for any occasion. Ideal with Mediterranean cuisine, pulses, sauteed vegetables, fish and beef, cold cured meats and cheese. A wine for everyday occasions. BBQ’s and parites. BOUQUET: raspberry jam, and soft spices. The wine is full-bodied in the mouth, rich flavours and a long silky finish. FOOD MATCHING: Venison, bull meat , beef, rack of lamb. NOSE: Intense, Citrus fruits with a fine mineral tone. PALATE: Light, nice acidity. Generous aromas, such as lemon. Apéritif, cooked shellfish, fishes in sauce and white meats, goat cheeses. NOSE: Full rich fruit bouquet with ripe apple, pear and apricot aromas. PALATE: A full flavoured Riesling with a fine balanced acidity, in the classic Bürklin style. Uncomplicated, but still fine and elegant. FOOD MATCHING: With light mediterranean cuisine, fresh salads and shellfish. COLOR: Pale yellow color. NOSE: Delicate bouquet of fruits and flowers aromas. PALATE: Well balanced, fresh and elegant. FOOD MATCHING: Ideal served with shellfish, or starters. NOSE: Fresh and vibrant tropical and passion fruit with hints of minerality, promising a satisfying taste experience. PALATE: The abundance of fruit is evident on the palate for this well balanced, enjoyable wine. This wine has a crisp finish and lingering aftertaste. COLOR: Pale yellow with green highlights. NOSE: Typical Sauvignan with a lemon and fresh grapes. PALATE: Fresh, lemony with a good length. FOOD MATCHING: Serve at a temperature of 9 to 10°C with oysters, other shellfish and goat cheest of Chavignol. NOTE: Fresh peach, melon and strawberry on the fragrant nose and in the mouth. PLATE: Silky and open-knit, but shows good lift on the gentle sweet finish. This supple, easygoing rosé will be flexible on the table. NOSE: On the nose, the wine initially displays floral notes hawthorn blossom, white flowers…), followed by aromas of toast, marzipan and ripe fruits (apples, pears…). PALATE: Fresh and full-bodied, elegant, structured. The finish has rich fruity aromas. FOOD MATCHING: It is ideal as an aperitif and may also be drunk with a variety of fish dishes (salmon, turbot, John Dory), poultry and white meats. COLOR: Light straw yellow in color with bright yellow highlights. NOSE: Unmistakable aromas of golden apple with a hint of white peach. PALATE: Well balanced acidity, a fresh and lively mouthfeel with a clean dry on the palate. FOOD MATCHING: Vegetable, vegetable soups, mushroom, fish servings and barbecued fish. PALATE: Opulence and soft elegance. FOOD MATCHING: Paired with shellfish, fresh cheese and light meats.